So I’m a big freak about Rankin/Bass holiday TV specials. EVERYBODY knows the Christmas classics… Rudolph The Red-Nosed Reindeer, Santa Claus Is Comin’ To Town, Frosty The Snowman, etc. But Christmas isn’t the only holiday that ol’ Jules Bass and Arthur Rankin gave the song and dance treatment to. No sir! There were three not-as-well known Easter specials. Of which I knew *of*, but had never even watched until last spring when I found both at Target on DVD. The basic idea of this is that the current Easter Bunny, Col. Wellington B. Bunny, is getting a bit long in the rabbit ears and is looking to pass on the mantle of Chief Easter Bunny to none other than fellow April Valley resident Peter Cottontail (played by Casey Kasem). But just as all great heroes are tested by a great villain, just as Batman has the Joker, God has the Devil, and Michael Jackson has sanity… Peter Cottontail has IRONTAIL! January Q. Irontail to be exact, voiced by none other than horror icon Vincent Price. Irontail, you see, is a bit miffed that in his younger years, a few mischievous kids caused the loss of his tail. Which I think is the most shocking and horrific thing ever spoken about in a Rankin/Bass special. I mean, really… The kids maimed his tail? Anyway, he now has a prosthetic “iron tail”. And his name is Irontail. Wow, that’s a really creepy coincidence. That’d be like me having the last name of Peanutbutterlover and then ending up really, really liking the taste of peanut butter. Funny how the world works, no? Back on topic, Irontail wants VENGEANCE! Easter egg baskets are best served cold or not at all because Irontail wants to ruin Easter for all kids for all time. But would he really be ruining anything? I mean, I know the story behind Easter, but honestly, at best, as a child, it was nowhere near the mass hysteria level of Christmas or my birthday. Heck, commercialized Easter is more or less all about candy but even then, Halloween blows it out of the water. So in a kid’s eye, you’ve basically got a fourth ranking holiday that wouldn’t disappoint much if it was cancelled. You could end up with more candy if you cry just enough on a regular trip to the grocery store than you would get from Easter. So through nefarious means, Irontail takes the crown of Chief Easter Bunny and sets forth with many new silly Easter laws, leaving Peter Cottontail to walk away from April Valley with his ears hung low (wobbling to and fro). But wait! In a scene that obviously inspired the character Yoda from Star Wars, Peter Cottontail runs across Seymour S. Sassafrass schooling our young rabbit friend in the ways of dyeing Easter eggs and offers up somewhat of a cheap out—a time machine (the “Yestmorrowmobile”) to set things right with Easter by traveling to the past and winning the contest! Stories of dismemberment? Cheating to win? Rankin/Bass has taken a turn for the worst! And why is time travel being brought into an Easter Bunny story? The story doesn’t end here though. No, Irontail is truly a worthy villain by catching wind of the time machine plot and sabotages the controls sending ol’ Petey and Antoine (the French caterpillar pilot of the time machine) through a variety of holidays… except Easter! Cottontail tries to pawn the eggs off at these various stops… Christmas, Fourth of July, Valentine’s Day, etc. But nobody wants eggs during those holidays. There’s a particularly dated scene here during Valentine’s Day with an absolutely horrible 70s love song as Peter meets and ice skates with a female bunny. Well, I guess I don’t have to tell you how this ends up. Peter saves the (holi)day, Irontail sees the error of his way, and all are happy and gay. But not homosexual “gay” even though Rankin/Bass seemed to be pushing the envelope with this special. Unfortunately, this special eludes me. It’s currently not available on DVD, but used VHS copies can be found fairly cheap on Amazon. Most of the Rankin/Bass catalog is split between Sony and Warner Brothers, so hopefully whoever owns the rights to this will get on the ball and give us our darn DVD! A previous bad experience with buying through personal sellers online holds me back from trying to pick this one up on VHS just yet. UPDATE: The First Easter Rabbit is now on DVD and you can read my review here! Okay, think of Santa Claus Is Comin’ To Town. Replace ‘Christmas’ with ‘Easter’ and ‘Santa Claus’ with ‘Easter Bunny’ and there’s your story. Still, not a bad template to try to follow and it worked once before, so why not here? Fred Astaire even reprises his ‘Santa Claus Is Comin’…’ role as the narrator mailman. This tale involves Sunny the Easter Bunny, who wants to explore outside his hometown of Kidville and stumbles upon a dreary town featuring the puppet regime of King Bruce (a boy who makes whatever laws his nasty aunt tells him to). But while we’re here, one thing that drives me crazy about RB specials is lack of continuity. Rudolph and Frosty had a few true sequels (even teaming up during the Fourth of July!) which more or less kept things cohesive. Then you’ve got multiple specials that stand alone, yet feature the same holiday characters. The Year Without Santa Claus and Santa Claus Is Comin’ To Town Santas have no connection to each other, Jack Frost starred in his own special as a kind-hearted winter maker living up in the clouds, but also popped up in a Frosty special as a mean-spirited winter spirit wanting to destroy Frosty, and the three Easter specials feature three different Easter Bunnies complete with totally different origins. And just who controlled winter anyway? Jack Frost (good or bad)? Snow Miser? Winter (the appropriately titled evil wizard from Santa Claus Is Comin’ To Town)? Rankin/Bass was *almost* as bad as WWE when it comes to showing lack of continuity. Yes, things like this worry me late at night as my mind tries to make sense of it all. Saved By The Bell is another show that I love, but their inconsistencies drive me crazy, but I digress. HA! You weren’t expecting THIS were you?! Thought we were done, eh? Well, it’s not a true Rankin/Bass film. The Rankin/Bass name pretty much exists only to let you know it’s a Rankin/Bass classic. And that quality is guaranteed. BUT… This *is* a sequel to the original Here Comes Peter Cottontail put out by Sony’s Classic Media division. Why not Here Comes Peter Cottontail 2? Or Here Comes Peter Cottontail Again? Or Here Comes Peter Cottontail: The Sequel? I don’t know. I guess they didn’t want people to confuse this with Here Comes Peter Cottontail: The Board Game, Here Comes Peter Cottontail: The Ride, and Here Comes Peter Cottontail: The Toilet Paper. Now, I’m assuming you realize MOST Rankin/Bass specials were stop-motion animation or “Animagic” as the company referred to it as. Sadly, that’s seen as archaic these days (I actually think it’s really neato), and if you’re not CGI, you’re just not trying. So a CGI Cottontail we get here. Surprisingly, for a direct to video kids movie, the animation is pretty good. Full of beautiful colors and cute creatures, it is! And this isn’t some vague sequel. We’re still in April Valley and Peter Cottontail is still Chief Easter Bunny. But this movie isn’t about him, it’s about his son, Junior. Here Comes Junior Cottontail? Nah, wouldn’t work. Even ol’ Irontail is back (voiced by Moore… Roger Moore) and apparently his turn to good didn’t take and he ends up in cahoots with Jackie Frost (the queen of winter… descendant of Jack Frost) to turn the world wintry forever. This plan involves April Valley’s Clock of Spring where Irontail and Jackie, through negligence of Junior, are able to take the spring from the clock preventing March from turning into April, and thus no spring season. Irontail & Jackie set off to steal the Sun of Summer and Leaf of Fall as well. This is a classic buddy road film, as guilt sets in and Junior goes off to track down Irontail and get the clock spring back, and runs across a few newfound friends to help him—Flutter, a robin, and Munch, a mouse. Even Antoine the caterpillar makes an appearance as Peter gives him the responsibility of going after Junior to make sure he’s safe. I was really surprised by just how good this movie was. I liked the continuity and returning of many characters from the original special, I liked the animation, and even the songs were likeable. 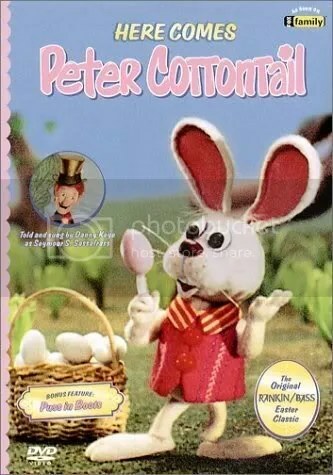 This isn’t a classic, but it came in a two-pack with the original Peter Cottontail DVD, and for the $14 it cost me, it was well worth the money. Does anyone have copies of HERE COMES PETER COTTONTAIL and WILLY MCBEAN AND HIS MAGIC MACHINE? I am in Australia and would love copies but can’t find them anywhere. What happened to the Easter specials this year? This is the first year I can remember that absolutely NOTHING has been shown in regards to the classics like the ones listed above. 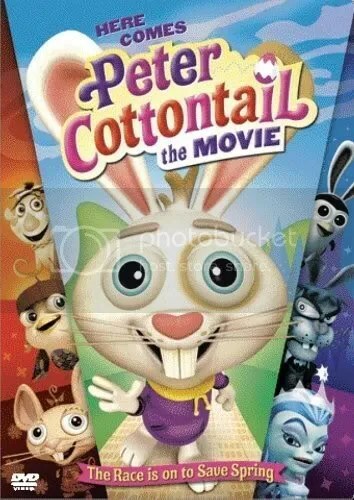 One or two years ago I remember seeing the “Here comes Peter Cottontail: The Movie” on cable and that was about it. Boomerang, Cartoon Network, and ABC Family all let me down this year…. MeTV Here Comes Peter Cottontail and Lamb Chop’s Passover Surprise aired on Easter evening this year. Where are my stop-motion animation treasures?!? KTV on DishNetwork also aired Fat Albert’s Easter Special. The Ten Commandments aired on Saturday evening for the ABC affiliates; I thought it was always Sunday night? Not sure. I usually don’t look for Easter specials since there’s so few in the first place. I do remember ABC Family showing some of the specials I talked about here in years past but I didn’t notice anything myself about Easter other than History Channel running specials on The Ten Commandments, angels, etc. And yes, traditionally ABC would air The Ten Commandments on Sunday night. I saw something either in a paper or on a news program (and didn’t check out the full story) saying that Easter is may be starting to fade in popularity. I think we will have to rely on the Retro channels to fill that void. Oh well, I wonder what Easter will be called in 10 years, or will it still even be acknowledged? The Hub aired a Tiny Toons “Spring Break” special of sorts, but it was the only channel to have a “Happy Easter!” message on the lower right-hand corner of the screen along with a Hub Easter Egg graphic. ABC–constant from years past with “The Ten Commandments” on Saturday night and “It’s the Easter Beagle Charlie Brown” airing Sunday night. The same goes for Turner Classic Movies (see above 3-31-13 entry). KTV and the retro channels had absolutely nothing this year; not even “spring cleaning” related. Boomerang aired “The Man Called Flinstone” in what should have been a Yogi Bear block. “Hop” aired on ABC Family (this channel is essentially Disney 2). True to IFC caliber, a “Cheech and Chong” movie marathon ruled the day; it would have been interesting to see what would have otherwise aired in light of it being April 20th… Rankin-Bass specials, where have you gone? “The Ten Commandments” moved back to Sunday night with the only Easter Beagle to be seen this year was in the Sunday comics. Reeses peanut butter egg and Cadbury bunny commercials were frequent this year. Turner Classic Movies was stalwart as ever… (see 3-31-13 entry) The History Channel had the 2013 “The Bible” mini-series, while H2 aired “Jesus: The Lost 40 Days”. “The Ten Commandments” moved back to Saturday night this year; and the Easter Beagle was nowhere to be found. Cadbury Bunny commercials were frequent again this year, with a few Lindt gold bunny ads airing as well. On 3-20-16 FOX aired “ice Age: The Great Egg-Scapade” along with Tyler Perry’s “The Passion.” Curiously enough, Cartoon Network came through this year with Basket Fulla Premieres on Good Friday, (hosted by the Easter Bunny) airing new episodes of Clarence, Uncle Grandpa–“Uncle Easter”, and Teen Titans Go Easter Special. 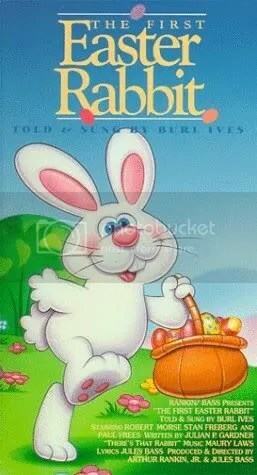 I’m almost certain that Regis Philbin played the Easter Bunny on “Uncle Easter”, but I’m not positive. Discovery Family showcased My Little Ponies this year. Even Comedy Central is airing some South Park themed Easter episodes tonight. No Rankin-Bass specials aired this year. 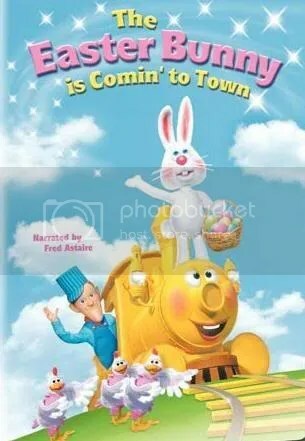 It would be great if the networks could show “Here Comes Peter Cotton Tail ” ” The Easter Bunny is Coming to Town ” and ” The First Easter Rabbit ” I mean even Boomerang hardly shows much holiday shows anymore. I knew Boomerang would change to more modern shows when it’s billed as a retro cartoon station. I guess they need to come out with Boomerang 2 Retro only cartoons from 90s down. Cartoon Network (at least in the form of Teen Titans Go) came through with “Easter Creeps” in which both the Tooth Fairy and Easter Bunny save Easter in a simultaneously creepy and hilarious manner. Even “Smurfs: The Lost Village” was touted with bumpers that stated “….this Easter”–even though the movie was released April 7th, 2017. The only Easter Beagle to be seen this year was in the Sunday comics. “The Ten Commandments” aired again on Saturday night. Comedy Central continued with South Park themed Easter episodes. IFC started with Aliens v. Predator and moving on to “Exodus gods and kings.” “The Great Egg-Scapade” aired again on FOX this year. Interestingly enough, no Tyler Perry event was scheduled this year. What was once ABC Family (now Freeform) aired the “Twilight” series in its entirety. (Pat Robertson’s ears must be flapping out of control by this point) I do believe that ABC Family was the network that aired Rankin-Bass specials, but that was well over a decade ago. No Rankin-Bass Easter specials aired this year. JC Superstar Live will feature John Legend this year on NBC. Now who would Alice Cooper portray? No new Easter hilarity from Cartoon Network. The movie “Ferdinand” was touted with a “bulls vs. bunnies” motif for an Easter release on Blu-ray. The only Easter Beagle was again found in the Sunday comics. “The Great Egg-Scapade” shown for the third year in a row on FOX; sans Tyler Perry again. “The Ten Commandments” aired Saturday evening. Cadbury (as well as Reese’s) Easter egg commercials were strong along with “Build-a-Bunny” ads for high end stuffed animals. (Remember when the “ball” doll cuddly Dudley sufficed for Easter enjoyment?) Target even got in the game with “Everything is Easterday.” No Rankin-Bass Easter specials aired this year.